Karuna Society does a lot more than just feed cows. They go to the villages to educate them about the harm plastic bags does to the cattle, other animals and to the environment. 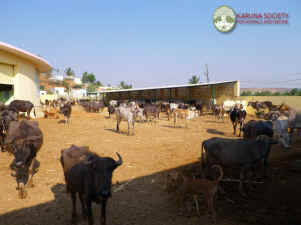 Karuna Society for Animals and Nature that has been established in Southern India since 2000. It is a registered non-profit organization working for animal welfare and the environment by providing free medical care and shelter for sick, injured, abandoned and abused animals, while sustaining all food production with organic farming and alternative fuels. We have two small hospitals for small and large animals as well as a rescue center for cows and buffaloes that have been rescued from slaughter. In this area it is prone to drought. Our summers start early March and go on till June. As our bore wells are failing and we are having 12 hour power cuts we are dependent on tankers that bring in water for our animals. We have 300 cattle that are permanent residents at Karuna who are fed grass that we have been able to save and store for the summer. However, last week we got a call from an animal rights group saying that they had stopped a truck load of cattle that were on their way to slaughter and were planning to take them to a rescue shelter that is in another state. Due to the case being filed in our state the cattle had to remain here until the case goes to court, which, in India could take months, maybe years. In their desperation they pleaded with us to take the cattle so we now have another 146 which is a hardship for us as we only have enough fodder for our own cattle and we are not getting any financial support from this group. 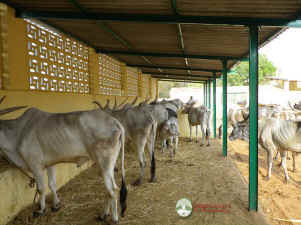 Our request is that we urgently need funds to purchase fodder for these cattle. For the first time in Karuna's history, a local farmer heard about the rescue and is trying to help us by giving us some of his grass which is a small amount but we were so moved by this offer as it is a hard time for all farmers in this area.